escue the perishing, Care for the dying; Jesus is merciful, Jesus will save.” I remember singing this familiar Fanny Crosby hymn when I was a young boy at church. My young mind quickly grasped the necessity of evangelizing lost people. That’s what pastors did. But caring for the dying was more difficult to understand. Why do we often feel uncomfortable providing pastoral care in situations where people are near death? Perhaps part of it is that the death of another reminds us of the fact that we, too, are mortal and are going to die. The end of life is filled with a wide range of emotions, both in the person dying and in family and friends. How, then, can we effectively provide care for dying individuals? 1. Come alongside them with compassion and empathy. It’s easy to think that if we just had the right words to say everything would make sense. But when we don’t have all the answers, Psalm 23 reminds us that although we may be going through the valley of the shadow of death, we are not alone. The Shepherd’s presence makes the journey easier. We are the shepherds of our flock, the church, and we need to think of ourselves as leading and walking alongside those who are facing death. 2. Facilitate community, so they do not feel alone. Community may be a close-knit family or a group of friends who care for each other. As a community, the church needs to surround the dying person with the love and support that we all long for. Mother Teresa established her ministry to the poorest of the poor in Calcutta because she believed that no person should die alone. 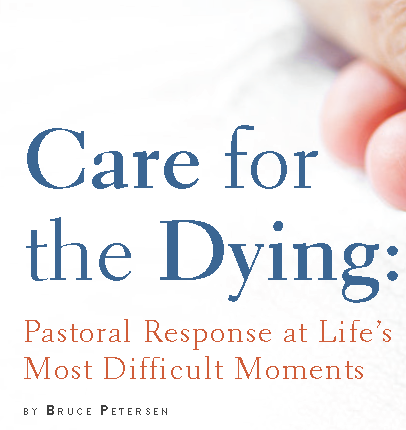 The task of caring for the dying should not fall solely on the shoulders of pastors and family. The body of believers, the church, can make the process of death more bearable, even joyous. 3. Take time to listen. Many who approach the end of life may have questions that they feel hesitant to voice to anyone. Even Christians may wonder why, if they have faithfully served God, their prayers for healing go unanswered. Feelings of anger can erupt, which may surprise the dying person or the family. We can give permission for the person who is dying to express those feelings of anger or disappointment or fear without passing judgment. Being a good listener also means encouraging the person to share pleasant memories from the past that may bring a smile or a tear with the telling. It takes time to be a good listener. Keep your eyes off your phone or the door, and give the person your full attention. That can be the greatest gift you can give at that moment. 4. Be a spiritual guide. 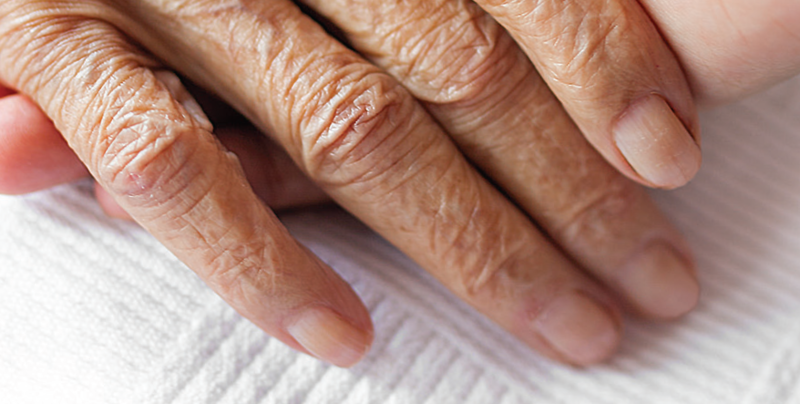 People often come to the end of life facing spiritual concerns. For those who have never had a personal relationship with Christ, this can be a moment of accepting God’s free gift of salvation. As a pastor, you have a responsibility to answer the dying person’s spiritual questions with a clear, simple presentation of the gospel. Spiritual decisions made in the last moments of life are as valid as those made many years before. Jesus replied to the thief hanging next to Him on the cross, “Truly I tell you, today you will be with me in paradise” (Luke 23:43). Even people who have faithfully served the Lord may have serious spiritual questions. Some may feel guilty that they did not do their best in every situation while serving. They may have unresolved relational issues with family or friends. This is an opportunity to facilitate healing and forgiveness in broken relationships. The sacraments of baptism and the Lord’s Supper can be wonderful means of grace to those who are dying. A person who has received Christ as Savior while in the hospital can be baptized by sprinkling while lying in bed. Taking the Communion elements to one who cannot attend worship services is a tangible way for the person to receive God’s grace and feel connected to the body of Christ while in his or her sick bed. I remember our family standing at the deathbed of my mother, singing hymns and reading scriptures. Although a dying person appears to be unaware, the sense of sound is the last remaining sense. We can help make those last moments of life blessed moments for the person. As a pastor, I always assumed that the person could hear the prayers, hymns, and scripture readings being offered as part of God’s gracious gift of ushering the person to his or her heavenly reward. Caring for the dying also means caring for the family and loved ones who stand alongside the dying person. They go through similar states of grief that the dying person experiences. Often, they attempt to be strong in their loved one’s presence, but inside they are suffering the pain and fears of impending separation. Give special attention to the spouse and children. They may be facing difficult decisions regarding treatment options and financial implications, and everyone may not be united on the best course of action. A pastoral caregiver can stand beside the family as they weigh their options. It is rarely advisable to choose a side, or to try to influence decisions for the family. Sometimes decisions need to be made immediately, but if a decision can be delayed, families can consider all options more fully. If death is imminent, a pastor can begin guiding the family to consider the elements to include in the funeral. Components such as a favorite hymn, a scripture passage, or a testimony of a grandchild can be arranged even before death. Sometimes the person who is dying has suggestions for his or her own funeral service. Keep these notes available, so they can be found when you help plan the funeral. It is a privilege to represent Christ the Great Shepherd as you care for the dying. For a more extensive treatment see Bruce Petersen's, Foundations of Pastoral Care, Chap. 14, “The Pastor’s Presence amid Death and the Dying” (Beacon Hill Press of Kansas City, 2007).